O human being your life upon this jag - upon this world is aisaa - is like supanae - is like a dream. This world is just like a dream. How long is it like a dream? How long does the dream last? - as long as you are asleep. In the same way, we believe all of the physical and material things of this world to last forever. We think that we are going to live forever. Even though we say we don't think that but actually we don't ever think that we are going to leave this earth. We think that all our material things are always going to remain with us. Whilst we are asleep in this slumber of spiritual ignorance we think that everything is real. In your dream whilst you are asleep, you think that everything is real. It seems like that is the real truth. But when you open your eyes you realize that all of that simply faded away. In the same way those who have opened up their spiritually, those who have been blessed with spiritual wisdom by the Guru they realize that all of these things, material goods are transitory just like a dream, they will not last forever. Bhagat jee says, jeevan supan smaanan - Waheguru jee who has given us this jeevan - who is the real support of our breath, our soul, our life - supan sumaanan - we've understood Waheguru jee to be like supan - like a dream. Oh, God might exist and might not exist some people say. May be we should follow the Guru and maybe we shouldn't, all of these doubts are going through our mind. Guru Sahibjee says in Guru Granth Sahib and Bhagat Kabeerjee is saying in this shabad O human being the true dream, the dream which is this world, which are material goods - you've clutched on to that, you've grabbed hold of that, but Waheguru who will remain forever, who is eternal you have doubts about Him, about Waheguru jee. You haven't grabbed hold of Waheguru. Saach kar ham gaath dheenee - believing the material goods to be true I've gaath dheenee - I've grasped, gaath literally means a knot, what this means is that I've tied my beliefs so firmly, I've tied the knot so firmly that this is true - that that is how I am living. Shodd param nidhaanan - I've given up, I've abandoned the param - the greatest nidhaanan - treasure, which is Waheguru, which is Naam - the Name of God. 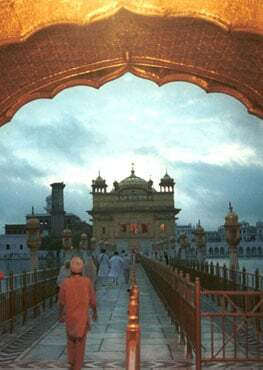 I've thought that this dream of the world is true and I've forgotten Waheguru. Baabaa - this has two meanings, it can mean father, an elderly figure and it can also be talking to the followers of the path, followers of the path of spirituality or it could be saying a prayer to Waheguru. maaeiaa moh hit keena - I have hith - attached my love, my attachment to maaeiaa - I've attached myself to this illusion, these material goods, this maaeiaa - this dream around me. I've attached myself to this and what has happened? This attachment, this illusion has hir - has taken away the rathan - the diamond of giaan - of spiritual wisdom. How is that? When we get stuck in the world we miss our amritvela, we miss our nitnem. When we get stuck in the world we speak harsh words to people, we forget that one day we are going to leave this earth and all of these actions are going to be judged. Rehaao - Bhagat jee says pause and think about this today. The pathang - the moth with his nain - with his eyes sees the flame, sees the beauty of the flame and ourajhai - is completely imbued with attachment for that flame. Pas n dhaekhai aag - that poor being, that poor insect doesn't see that the fire will burn him. In the same way we look at material beings and we think that they are so wondrous; they are so beautiful that they will give us peace but we really do not see that they are really going to burn us away. We look at intoxicants of the world, narcotics thinking that they will give us some sort of peace but we do not see that are really detrimental to us, that they are going to destroy us. We fall into desires but we do not see that those desires will only lead to pain. The mugadh - the fool doesn't remember that the kaal faas - the nose of death is hanging around his neck. The fool doesn't remember that one day s/he is going to have to die. Kanik kaamin laag - in this forgetfulness he or she laag - attached himself to the love of Gold. What does that mean? It could mean anything? Jewellery, Guru Granth Sahibjee, Bhagat Kabeerjee has used this world kanik - gold - that's standing for all material goods. Kaamin means women - the love of women, but it can mean the desire of men and vice versa. So being attached in this greed for material things and these desires we forget that we are going to have to leave this world one day. Just like the moth sees the flickering of the flame and thinks that it's so beautiful but ends up being burnt by it, in the same way we see these pleasures and delights of the world but we do not see that they are burning us. Reflect upon this, do bichaar - think about this, bikaar parehar - do not just think about it, give up these sins. Tharan thaaran soe - that Waheguru is the One who is tharan thaaran - who will liberate you from this world, who will carry you across the world ocean. Bhagat Kabeer Sahibjee says jagajeevan aisaa - Waheguru is the light and soul of this world, dhutheea naahee koe - there is no other like that Waheguru, like God. Waheguru is the only eternal truth. Bhagat Kabeerjee is saying there is nothing else to be attached to, attach yourself to Waheguru jee.